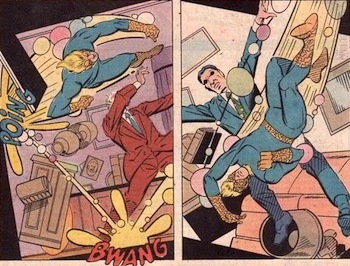 Speedball: Fighting evil one reckless ricochet at a time. "New game! It's called dodgeball!" A Bouncing Battler is, quite simply, a character whose primary form of attack is to jump or bounce off everything in sight — walls, floors, ceilings, and especially opponents. While jumping is a common tactic for acrobatic fighters, the Bouncing Battler is distinguished because he typically doesn't have any extraordinary abilities or fighting skills; instead, he relies almost entirely on his mass and momentum to do the work, typically becoming a (figurative) living Hyper-Destructive Bouncing Ball in the process. Frequently appears as the protagonist in Platform Games, largely due to the enduring influence of Super Mario Bros.. Not to be confused with fighting game females with buoyant bodies. Also see Be the Ball, Hyper-Destructive Bouncing Ball, In a Single Bound, and Pinball Projectile. Rurouni Kenshin: More mundane than most versions, but Kenshin leaps off walls and ceilings quite often in order to get the drop on his enemies. Majin Buu of Dragon Ball Z becomes this when he performs his ball attack. Rock Lee of Naruto demonstrates this in his fight with Gaara, after unlocking several of his chakras. One Piece has Bellamy, who ate the Spring-Spring fruit. He literally fights by bouncing around until he's fast enough to hit them hard. Luffy, being made of rubber, can do the same thing if the situation calls for it, but he doesn't do it often. This is the basis for the Pokémon move "Bounce". Marvel's Speedball, except for his stint as the Darker and Edgier Penance, bases his entire fighting style on this. He can create a kinetic force field around himself that allows him to bounce off obstacles at great speed, which he then uses to knock out opponents with twice the force. Captain America's recurring villain Batroc the Leaper has extremely well-developed leg muscles, allowing him to leap great distances. He supplements this with skills in kickboxing. Spider-Man's wanna-be sidekick Frog-Man uses a frog costume that jumps with powerful springs. His portly physique and lack of combat training means he typically defeats opponents by inadvertently bowling them over. Astro City has the Bouncing Beatnik, a mystical entity who's been shown fighting an army of shark-men by leaping around and throwing them. It runs in the legacy, as the Beatnik's predecessors have been shown doing similar things. Legion of Super-Heroes: Bouncing Boy combines this with Be the Ball. One story revealed that he'd studied advanced mathematics to learn to aim multiple bounces just right. Similarly, the 1985 Squadron Supreme limited series featured a B-grade villain named Pinball based on this trope. He'd inflate his jumpsuit into a giant ball, then bounced or rolled into his targets. Bouncing Betty is an X-Men villainess with an extraordinary ability to bounce, leap and jump. She is unusually large and unusually strong, and uses her strength and bouncing skills in combat. In addition to being his primary means of locomotion, Toad of the Marvel Universe mixes this with his tongue and other powers Depending on the Writer. In Worm, the child supervillain Bambina combines this with Having a Blast; her power lets her ricochet off surfaces and create explosions at the point of contact. The Super Mario Bros. are undoubtedly the most famous example. Mario's tendency towards this is lampshaded in Super Mario RPG. After Mario beats Jinx, a professional martial artist, in a Bonus Boss fight, Jinx and his student decide to incorporate Mario's jumping techniques into their own fighting styles and spend the rest of the game bouncing up and down on one spot trying to emulate Mario. Kirby's Ball ability, from its singular appearance in Kirby's Adventure. The Wii Play: Motion minigame "Jump Park" is based on this — the player must gather gems while bouncing around the playfield nonstop. The Nintendo Wii game Fling Smash combines this with Be the Ball. The player throws the rotund hero, Zip, around a series of playfields so that Zip will bounce off obstacles, collect treasures, and defeat bad guys. Some enemies are only vulnerable from certain angles, so strategic bouncing is required. Sonic the Hedgehog most commonly jumps into enemies or uses a homing attack, but in Sonic Adventure 2 he gains a move called simply "Bounce" where you can endlessly bounce, letting you annihilate any mooks in the area. From the Classic series, Strike Man from 10 curls himself up into a ball and bounces around the arena after throwing fastballs at Mega Man. Bounce Man from 11 bounces against the walls if hit with a charged Mega Buster shot, and will bounce even faster when Speed Gear is engaged. Armored Armadillo from Mega Man X1. He does have other attacks, but will mainly use the one where he bounces all over the place. From Mega Man Zero, Hanumachine can wreath himself on fire and then flies and ricochets off walls, while Rainbow Devil literally bounces around. Helter Skelter's nondescript and nameless player character can be taken as one, since it's a ball that attacks monsters by bouncing at them. Puyo Puyo has Dongurigaeru, a round frog that rolls around in an acorn top. Yuuki Terumi of Blaz Blue Chrono Phantasma does his in his Screeches of the Condemned Distortion Drive. In his finisher, he covers himself in his Sickly Green Glow and dunks the opponent into the floor, complete with dragon roar. Dire Wolf, Diatryma and Smilodon in Carnivores Ice Age. Coelophysis, Herrerasaurus and Postosuchus in Carnivores Triassic. Pulseman of the same game has access to the Volteccer move, where he turns into a small sphere surrounded by electricity that goes ricocheting off every surface he hits at high speed. He can plow through weaker enemies with this move, and bounce off tougher enemies to hit them again when he comes back in their direction. It's fast, nearly unsteerable (due to the way the bounces work), and a lot of fun to use. It also helps you move around quickly and is instrumental in defeating The Rival in a Mirror Match. The Slylandro Probe in Star Control II is unique among all the other starships in that it cannot stop moving. Ever. It's always charging ahead at its maximum velocity, unaffected by gravity, and hitting the thruster makes the craft reverse direction instantly, maintaining its momentum. Coupled with its weapon being very short-range and auto-aiming at the opponent, the Probe will be zooming all over the place, Cherry Tapping the whole time. The indie crossover game Indie Pogo is built entirely around this idea; every character jumps nonstop, and attempting to Goomba Stomp your opponent is one of the main methods of combat. The Spectacular Spider-Man: Ricochet tucks himself into a ball and becomes a living Pinball Projectile once he gets a super suit. Similarly, Rikochet from ¡Mucha Lucha! has his "Pulverizing Pinball" finishing move, in which he turns into a giant pinball. A special potion gives the Gummi Bears the power to bounce for a limited time, which they use to escape danger or defeat their enemies. Cannonbolt from Ben 10 combines this with his weight and Rolling Attack. The Harlem Globetrotters Animated Adaptation The Super Globetrotters features Curly Neal as "Super Sphere". He could transform himself into a basketball and dribble himself. It's every bit as amazing as it sounds.